Like the road network itself, there are ongoing needs for repairs and improvements on these pages ... ! I'm a vehicle user of unsurfaced public rights of way ; commonly called Green Lanes. I also research currently un-recorded, or under-recorded, public carriageways. I drive mostly in my home area (Berkshire, Hampshire) but sometimes further afield. I don't intend to give a how-to guide for RoW claims or defence ; others can give much better advice than me ! Join GLASS, TRF, CTC or BHS depending on your transport - or if you don't think we should be doing this at all join the RA. See the links here . 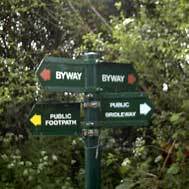 "Making the Best of Byways"
An official DoE (now DETR) government document aimed at local authorities, offering advice on managing Green Lanes. Useful to beat a disinterested or heavy-handed authority with. 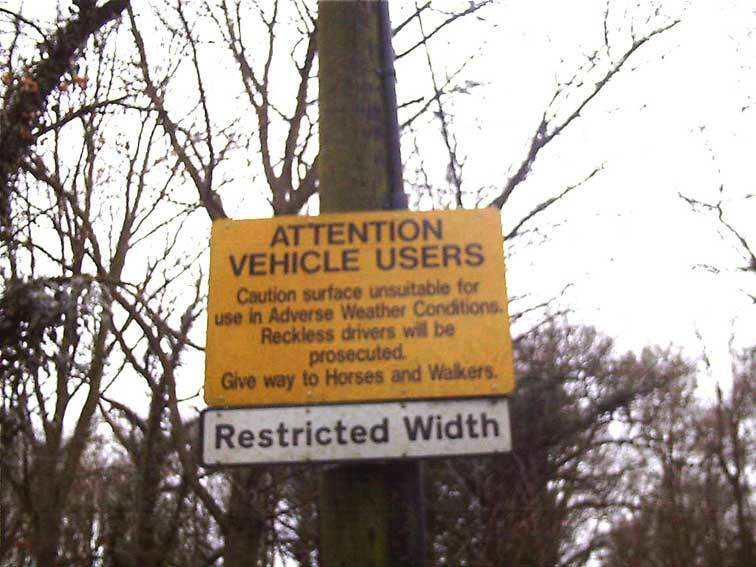 Oddly this can't be found on DETR/Countryside Agency websites. As a kind of follow-up to 'MBOB' above, a photo of a notice posted on byways by a Highway Authority near me ; I believe it's a useful reminder to vehicle users of their responsibilities when using fragile lanes. And might also be another alternative suggestion for a H.A. considering a restriction. [to follow] 1801 Inclosure Consolidation Act. [to follow] 1835 Highways Act. Relevant parts (for highways) of the text of the Act of Parliament replacing and updating the 1801 standardised terms. Needed for reference if you examine an Inclosure Award from after 1845. Strictly local stuff, my notes taken from an original parchment roll in Berkshire Records Office. Damn thing is 30 feet long!! Most of it relates to the landowners ripping off the poorer folk, sorry I mean improving agricultural efficiency, by fencing off the common land ; but there are also definitions of public highways, which is what I've extracted here. Old maps can be useful for showing the apparent 'reputation' of a road's status at a time in the past. I do have maps from other areas for swap or share, that might be of more use to other workers than me :) It seems to be an application of "Sod's Law" that the secondhand bookshops in any given area will have for sale the maps for everywhere else, and no local ones! Old "Barts" half-inch maps can be found all over when you look. There also seems to be a thriving trade in them on eBay auctions. This is my own accumulated notes of how to date them. A document collecting together my own notes about old time cartographers ; if you're presenting an old map as evidence for a long standing route, it helps to establish the map-maker's reputation with references. These samples were put on the web by genealogists; but for our purposes they also include highways information, and give some indication what to expect when examining an Inclosure Award. Apart from the sheer size of the document and the old fashioned hand script! A few extracts from this 1920 book by a bicycling country parson, who was also Honorary Secretary of the county archaeology society.